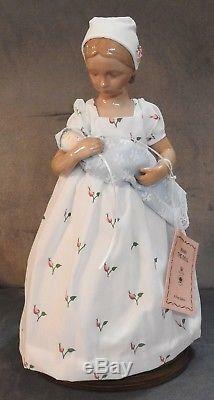 This is a Vintage Doll of the Year, First Edition 1983 B&G Bing and Grondahl - Royal Copenhagen Porcelain "Mary the Doll". This doll was made in Denmark. This doll is made by one of the premier porcelain companies, Bing and Grondahl, who have been making porcelain since 1853. 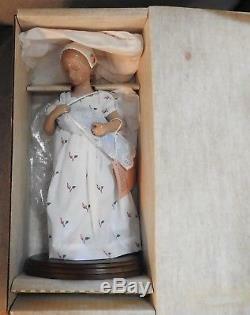 B&G modeled this doll after their very popular 1910 porcelain figurine of Mary. 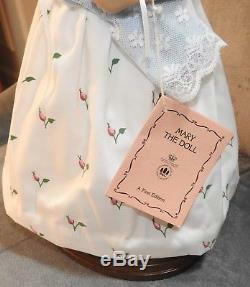 From the tag hanging from Mary's arm; Mary the Doll's head, arms, and legs are made of the finest hard paste porcelain and hand decorated underglaze. To obtain the subtle flesh color, pure 24 karat gold is used. 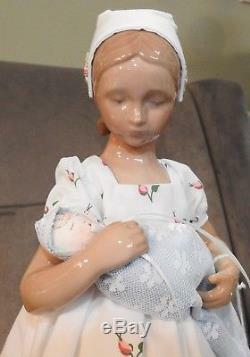 The porcelain pieces are fitted with finely detailed hand stitched accessories: a silkscreen rosebud gown, lace trimmed petticoat and pantalones, an embroidered bonnet and a baby doll. 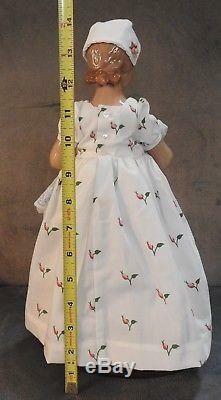 Mary measures 13 3/4 in height and comes complete with a hardwood base. 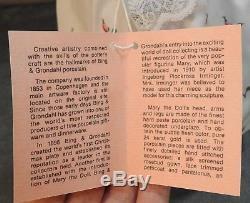 The edition is dated 1983 and production is limited to 1983. 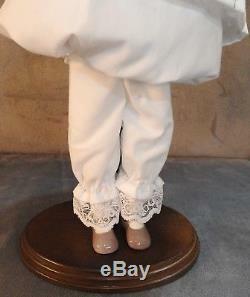 This doll is in perfect like new condition in the original box. 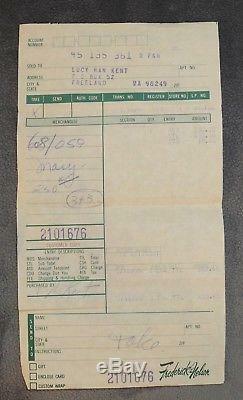 Inside the box is the original receipt from 06-12-1984. Some wear is to be expected, unless described as flawless or mint. I can't know everything about every item I offer, I do inspect each item and list all known flaws or damage. So please take a good look at the photos and ask questions if need be. 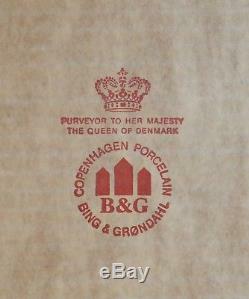 The item "Vintage B&G Bing and Grondahl (B&G) Mary the Doll Royal Copenhagen Porcelain" is in sale since Saturday, September 8, 2018. This item is in the category "Collectibles\Decorative Collectibles\Decorative Collectible Brands\Royal Copenhagen\Figurines". The seller is "wgoding" and is located in Kent, Washington. This item can be shipped to United States, Canada, United Kingdom, Denmark, Romania, Slovakia, Bulgaria, Czech republic, Finland, Hungary, Latvia, Lithuania, Malta, Estonia, Australia, Greece, Portugal, Cyprus, Slovenia, Japan, China, Sweden, South Korea, Indonesia, Taiwan, South africa, Thailand, Belgium, France, Hong Kong, Ireland, Netherlands, Poland, Spain, Italy, Germany, Austria, Israel, Mexico, New Zealand, Philippines, Singapore, Switzerland, Norway, Saudi arabia, Ukraine, United arab emirates, Qatar, Kuwait, Bahrain, Croatia, Malaysia, Brazil, Chile, Colombia, Costa rica, Panama, Trinidad and tobago, Guatemala, Honduras, Jamaica, Antigua and barbuda, Aruba, Belize, Dominica, Grenada, Saint kitts and nevis, Saint lucia, Montserrat, Turks and caicos islands, Barbados, Bangladesh, Bermuda, Brunei darussalam, Bolivia, Ecuador, Egypt, French guiana, Guernsey, Gibraltar, Guadeloupe, Iceland, Jersey, Jordan, Cambodia, Cayman islands, Liechtenstein, Sri lanka, Luxembourg, Monaco, Macao, Martinique, Maldives, Nicaragua, Oman, Peru, Pakistan, Paraguay, Reunion.